This dense and delectable flourless chocolate cake is perfect for Passover—or any time chocolatey deliciousness is called for! Preheat oven to 350°F. Grease and dust side of 9-inch springform pan with matzo meal. Melt 7 oz. of the chocolate as directed on pkg. ; set aside. Beat egg yolks and 1/2 cup of the sugar in large bowl with electric mixer on high speed until thick and lemon colored. Add margarine; beat until light and fluffy. Add melted chocolate, orange zest and walnuts; mix well. Beat egg whites in small bowl with electric mixer on high speed until foamy. Gradually add remaining 1/4 cup sugar, beating until stiff peaks form. Gently stir into chocolate mixture. Pour into prepared pan. Bake 35 to 40 min. or until toothpick inserted in center comes out clean. Cool in pan on wire rack 10 min. 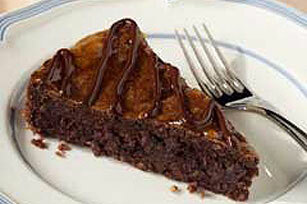 Run small knife or spatula around rim of pan to loosen cake; remove rim of pan. Gently loosen cake from bottom of pan with spatula; place cake on wire rack. Cool completely. Microwave jam in microwaveable bowl on HIGH 10 sec. Spread over top of cake. Melt remaining 1 oz. chocolate as directed on pkg. ; drizzle over cake. Let stand until chocolate is firm. Savor a serving of this indulgent special-occasion dessert that is perfect for family gatherings. One cake makes 12 servings. Vegetable oil spread can be used instead of margarine. For best results, use one that contains at least 70% vegetable oil.